Surely the USS Hornet (CV8) is among the most famous of US Navy ships. Active only for the space of less than nine months, she was in the thick of carrier combat in the first year of the Pacific War. Her most famous moment was the Doolittle Raid in April, 1942, when sixteen Army B-25s took off from her deck for the first raid on Tokyo. During the Battle of Midway in May 1942 Hornet's Torpedo Squadron Eight was completely wiped out attacking the Japanese carriers, but her dive bombers participated in the sinking of the cruiser Mikuma. In August-September 1942, Hornet was the only carrier available to oppose the Japanese during the campaign for Guadalcanal. In October her fliers mauled the Japanese carrier Shokaku during the Battle of the Santa Cruz Islands, but Japanese carrier planes also hit Hornet. Fatally damaged, Hornet was abandoned and later sent to the bottom by Imperial Navy destroyers. 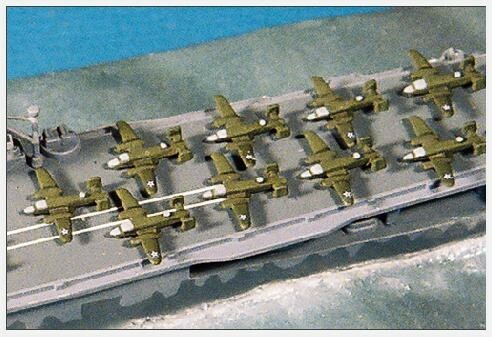 As with many of the Revell Germany 1/1200 line, Hornet is a repop of an old molding released variously over the years by Casadio "Mini-Ships", Altmark, ESCI/ERTL, Modelpower, MPC, and probably others. This toy/model from the early 'seventies is very simplified, snap-together affair designed for quick building. Interestingly, the kit was designed to be issued as Hornet's near-sisters Enterprise and Yorktown as well. As a result, there were a number of differences in each release such as alternate airplanes, armament, different islands, even differently positioned elevators. The present issue has a mix of features from all three sisters, and so is not technically correct for any one ship. Hull shape is only generally accurate, with an ugly blunt bow that looks more like that of a tanker than a sleek aircraft carrier. 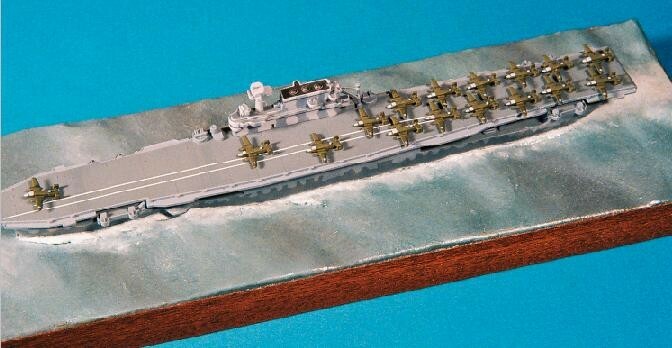 The decals included by Revell include outrageously wide yellow lines for the flight deck and an overlarge "Hornet" name in white letters for the stern. Snap together it may be, but the fit was not all that great. Parts had a good deal of flash; lotsa trimming away with the x-acto. I had a hard time getting the flight deck to snap down onto the hull. I ended up just forcing the damn thing! (It's funny; this is the same experience I had building this kit as a kid back in the seventies; either my skills haven't advanced that much or kits really were harder to build then...!) The island fit fairly well once I removed the locator blobs and sanded the bottom flat. Boats, crane, and masts, though basic, went on without any difficulty. The aircraft included are very small, and unfortunately very crude as well. The B-25s are just discernable as such, and the smaller carrier planes are unrecognizable as any specific type. They are covered in flash and attach to the deck with large pegs which fit into corresponding holes in the hangar and flight decks. Fortunately they are so miniscule they don't look too bad once painted and in place. I didn't even try to correct the various inaccuracies in the kit. It was hard to do at first, but I ignored those 40mm quads (never carried by Hornet), missing 20mm mounts, incorrect boat arrangements and other discrepancies and just forged ahead. This approach yielded a completely assembled model in less than an hour! I had put Hornet together out of the box as a painting experiment to test out the White Ensign Models Colourcoats line of paints (I plan to do a 1/350 Hornet eventually). The colors used were US 05 Late 1941 5-11 Haze Grey (for the island), US 06 Late 1941 5-0 Ocean Grey (the stripes on island and for the upper hull), and US 08 5-N Navy Blue (the lower part of hull to the waterline). The flight deck was painted US 11 Flight Deck Stain 21. The paints worked beautifully, and the intricate camouflage was fun to apply. I tossed the inaccurate kit decals, applying 1/64 inch white dry transfer lines from Woodland Scenics to the flight deck instead. The Army aircraft on deck were painted olive drab with gray to represent the glass areas. Early war US stars on their upper wings came from the excellent Navalis line of decals. Though simplified in design and full of inaccuracies, I actually enjoyed Casadio-Altmark-ESCI/ERTL-Modelpower-MPC-Revell Germany's Hornet. Sure the old girl has been around, but she's still good for a cheap weekend!